to discover our GioMio Collection! Diamond flowers spinning in the most beautiful way, ranging from exuberant rings to discrete earrings; this is the best way the Allure II collection by GioMio can be described. 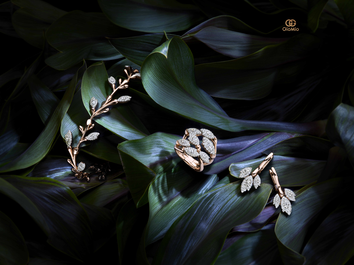 The newest collection of GioMio, combining pink gold with diamonds and mother of pearl. With each jewel carrying a unique colour of the slow growing Tahitian black mother of pearl, the rings, necklaces, bracelets and earrings are all one of a kind. The jewels in this collections sport carefully selected diamonds draped delicately like lace on white or pink gold. For everyday life or for cocktails at night - with Dentelle III a lady portrays elegance and frivolity. Imagine diamonds growing on the jewels you wear. Our Diamond Blossom collection was inspired by the natural forms of young branches with flowers growing inside the knot, ready for spring.